Last day to complete QuestionPoint next-steps survey! Today is the last day to complete the QuestionPoint Survey, available by clicking here: http://www.surveymonkey.com/s.asp?u=113032200129. It should take only about 15 minutes. We are eager to hear from all QuestionPoint librarians regarding your thoughts on upcoming features and enhancements to QuestionPoint, as well as your main concerns. By filling out this survey, you will provide feedback to the Product Team regarding next steps for QuestionPoint. The Flash Chat Monitor refreshes every 4 seconds. The behavior tends to appear when you pick up your first chat patron. The screen shots below are the frames of the Flash Chat Monitor that will repeatedly jump or blink, making it difficult or impossible for you to select scripts, type messages, or use other chat features. It should be noted that the center frame won’t reset and your session time continues to update as it should at the top of the monitor. In April 2006, Microsoft released a security update that changed how Internet Explorer handled technologies such as Flash. Specifically, the change was to ActiveX (See http://support.microsoft.com/kb/912812 for further technical details on this change). ActiveX is the name for the technologies used by the Windows operating system to manage and control the way programs interact with each other. Soon after the change, Microsoft pulled it due to issues surrounding its unintended impact on sites that use Internet Explorer's ActiveX controls to call programs such as Flash. Whether or not your computer is using the June 14 version depends on how it has been configured by your IT administrator to receive Microsoft updates. If the security update was installed on your computer, you may experience unexpected behavior in Flash-based applications, similar to what we describe above. How do I deal with this behavior if it occurs? If you experience this behavior, click X in the Flash Chat Monitor's browser window to close the Flash Chat Monitor. Next, click on 'Launch Flash Chat', which reopens the Flash Chat Monitor and will allow you to re-establish your chat session with your patron. What are some steps to prevent this from happening? 1. Request that your IT department update your Java software to version 1.5 if you are using the Sun Virtual Machine as there is a known issue with the change and Java version 1.4. 2. Update your Macromedia Flash player to the most current version listed on Adobe's web site by visiting http://www.adobe.com/ and clicking on the "Get Macromedia Flash Player" icon. 3. After the chat monitor loads, click one time on any part of the monitor (such as the white space under the words "Waiting for a selected chat session…".) This turns on the ActiveX control. After that, you may select a patron. Please contact Customer Service directly at 1.800.848.5800 or by e-mail at [email protected] . Please provide as much detail as possible when reporting your issue so that our development team may better pinpoint the exact cause. What is QuestionPoint doing to correct this if it is still happening? QuestionPoint put a fix into May’s install to specifically accommodate Microsoft’s mandated security update in April. This appeared to resolve the problem. Since then, Microsoft has backed out and re-issued the update, leaving us uncertain about why the blinking and jumping monitor may still be happening to some users. The development team is currently examining recent reports to determine if the problem has recurred because of further modifications Microsoft may have made to its June 14 update. We hope to share more information with you very soon. This must be the season for surveys! We want to gather as much information as possible about your usage and opinions on the QuestionPoint Knowledge Base features. This brief survey will help us understand levels of Knowledge Base awareness, as well as elicit your thoughts on the feasibility and usefulness of question-and-answer repositories, in general. We encourage all QuestionPoint librarians to complete the survey, which should take about 15 minutes. Please answer from your point of view, not that of your institution. You can stop at any time and return to the survey later. Even if you do not use the Knowledge Base feature at all, please go through the survey--you will be able to skip questions not applicable to you. Your input will help us determine the future directions of this particular QuestionPoint feature. Click the link below to fill out the survey. The survey will be available until July 15. Speaking of surveys . . . there is still time to have a voice in the prioritization of upcoming features and enhancements to QuestionPoint, in general. That survey will be available to you through June 30. If you have not already completed that 10-minute survey, please consider doing so. We need feedback from all users, email and chat users alike. Thank you for taking part in the future of QuestionPoint! QuestionPoint will have a number of interesting sessions as the ALA Annual 2006 conference, to be held in New Orleans, June 22-28. QuestionPoint will host the following sessions. Saturday, June 24, 1:30-3:30 p.m. Virtual reference cooperatives enable libraries to provide quality, real-time reference 24 hours a day, in the most cost effective way. Our panelists, representing a variety of libraries and constituencies, will discuss their experiences in working in a cooperative environment. Come share your experiences in this lively discussion! All times are local time. Sunday, June 24, 10:00-11:30 a.m.
OCLC Blue Suite, Hilton New Orleans Riverside Hotel. Discussion group for interested members. Sunday, June 25, 4:00-5:30 p.m. In addition to an update from the Transition Task Force and the QuestionPoint managers, Lynn Connaway and Marie Radford will give a brief interim report on their research of QuestionPoint chat transcripts. Monday, June 26, 2:00-3:30 p.m.
OCLC Green Suite, Hilton New Orleans Riverside Hotel. Please plan to attend any and all sessions if you will be in New Orleans! As the merger between QuestionPoint and 24/7 Reference nears completion, we are eager to hear from all QuestionPoint librarians regarding your thoughts on upcoming features and enhancements to QuestionPoint, as well as your main concerns. By filling out this survey, you will provide feedback to the Product Team regarding next steps for QuestionPoint.
. We will also summarize the data and publish it for those unable to attend. If you would like your comments to be considered at the user group meeting, please complete the survey by Friday, June 16. We will leave the survey link open until June 30, so you may fill it out anytime until then. An important change for long-time users of QuestionPoint’s e-mailed web-form features, scripts can now be inserted at the cursor. Scripts have always been inserted at the end of typed text in the Answer or Clarification field, when responding to an e-mailed question. After Sunday’s install, the script you can insert the script wherever your cursor is active. Finally, searching of your local knowledge base by your patrons is possible! Administrators must indicate if the local KB should be searchable outside the QuestionPoint application. They can also compose the ownership statement that should appear on every record retrieved. Only records marked “Public” in your KB will be searchable. Other alphabets should now be indexed properly in the QuestionPoint knowledge bases. This includes Arabic, Greek, Hebrew, Korean, and Russian alphabets, which were not searchable until now. A new table format in Ask/Reports/Sessions will allow you to see similar breakdowns for all your transactions, including grand totals. It is important to remember that the new breakout will affect data from the time of the install forward. The Reports Reference Guide will also be updated to reflect these changes. 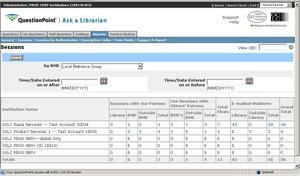 BME administrators should once again see the names of the librarians in their group’s libraries, via the Ask/Reports. Flash Chat librarians can now save the preferences they set within the chat monitor. The settings are attached to your login authorization, so if you change computers, you won’t have to reset them. There are new sounds for IM notification and for patron response notification. 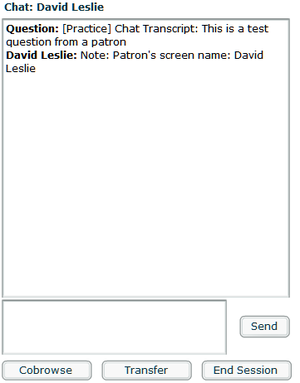 Additionally, there are visual cues in the chat monitor when the patron has sent a chat message. 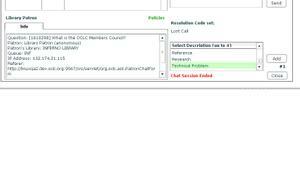 The Chat Monitoring Tool now more clearly shows each librarian and which queues are being monitored. Additional tweaks have been made to further reduce the likelihood of duplicated chat session requests. A new resolution code, Lost Call, has been added for Flash Chat users. Previously, the only two resolution codes were “answered” and “follow up” (by either chatting librarian or patron library). You can use the Lost Call code whenever a patron ends the call or drops, and you do not have sufficient information to send to follow up. When used, the ended chat session will go immediately to the Closed folder of the appropriate libraries. Flash Chat librarians will have visual feedback when they select multiple Descriptive Codes. A counter to the right of the code field will immediately indicate how many codes you have thus far selected. 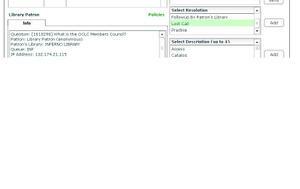 Please visit http://www5.oclc.org/questionpoint/Chat_setup.pdf if you have questions about your browser set up. There are several option settings that are recommended, as well as “best” versions of browsers, VM software, and Flash for optimum performance. Flash Chat users must click the Submit button when opening the chat monitor. Make sure your browser’s pop-up blocker is off, or you may not even see the window in which to submit your queue selections. We know some of you still occasionally experience the flashing frame problem: users of IE, with the XP operating system, see the chat monitor screen refreshing frequently, but without accepting any new input. This has been identified as a problem with Microsoft’s “Active X.” We understand that a patch is being distributed by MS, but the update may be dependent on your own network and IT staff. If you experience the flashing frame problem, exit the chat monitor by closing the browser (use the X at the top right of the browser window), then launch chat once again. You should still be in the same session, and will be able to continue chatting. All administrators need to be reminded to use http:// when entering URLs in the Administration module for your preferred Viewport page (chat users), your policy pages, your web form location(s) (all users), and location of branding logo (BME administrators). New Features, Changes, and Fixes Coming Sunday! An important change for long-time users of QuestionPoint’s e-mailed web-form features, scripts can now be inserted at the cursor. Scripts have always been inserted at the end of typed text in the Answer or Clarification field, when responding to an e-mailed question. After Sunday’s install, you can insert the script wherever your cursor is active. Finally, searching of your local knowledge base by your patrons is possible! After administration set-up, patrons will be able to link to a Basic Search page that searches your knowledge base, or they can even enter keywords in an input box on your library’s web form. An ownership statement, also set up by your administrator, will display at the bottom of every record from your KB. 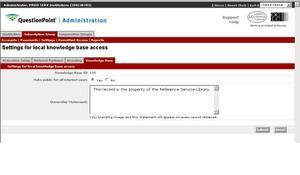 Only records marked “Public” in your KB will be searchable by patrons. Please go to http://www.questionpoint.org/education/index.html to see updated viewlets. ü Please visit http://www5.oclc.org/questionpoint/Chat_setup.pdf if you have questions about your browser set up. There are several option settings that are recommended, as well as “best” versions of browsers, VM software, and Flash for optimum performance.